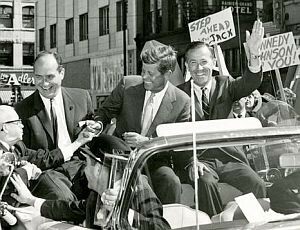 JFK was in Spokane, Washington state, one of 4 trips he made to that city during the 1960 campaign. He made an appearance in front of the Lincoln statue at the intersection of Main and Monroe after a parade through town. He was accompanied in the white convertible used by James J. Symbol, who was Kennedy’s campaign manager for the Eastern part of the state, Democratic national chairman Sen. Henry M. “Scoop” Jackson, and Gov. Albert D. Rosellini. Somewhat whimsically for at least part of the parade, a plastic donkey was placed on the trunk of the car behind JFK. After the parade and appearance, JFK met with Democratic leaders for a casual luncheon at the Desert Caravan Inn. Afterwards, Kennedy flew to Seattle to make campaign appearances.